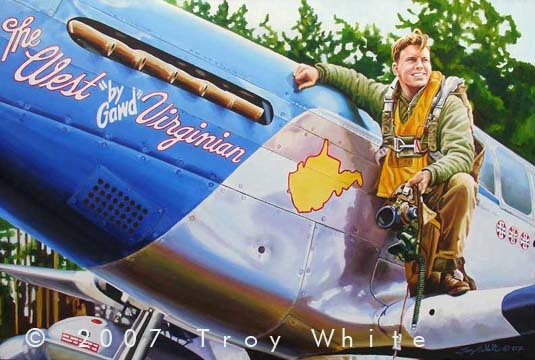 "The West 'by gawd' Virginian" features Lt. Bob "Punchy" Powell crouching on the wing of his P-51B Mustang The West "by gawd" Virginian in early July 1944. Bob "Punchy" Powell hails form Wilcoe, West Virginia where he was born on 21 November 1921. 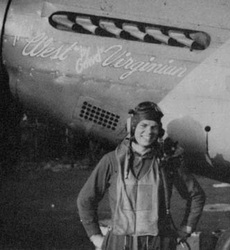 He attended West Virginia State University for two years before joining the Air Corps in early 1942. 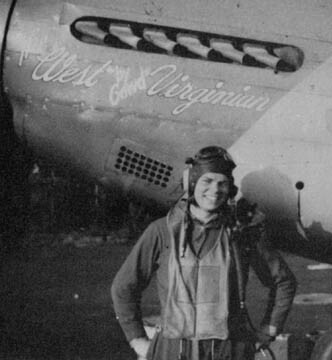 He was awarded his wings and commissioned a 2nd Lt. at Luke Field in January 1943. 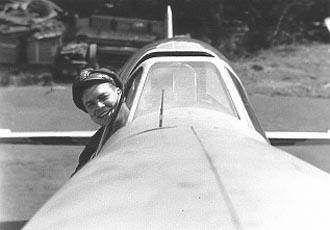 In April Bob was sent to England and after arriving was sent to Atcham to get checked out on the P-47 Thunderbolt. He had a chance to fly Spit MkV's while he was there and enjoyed its diminutive size compared to the big Jug that he was soon to be flying in combat. In November 1943 Punchy was assigned to the 328th Squadron of the 352nd Fighter Group based in Bodney, Norfolk. He flew his first mission as an Air Sea Rescue Spotter on Armistice Day. On 22 December 1943 he teamed up with Major Everett Stewart to shoot down a twin engine Me 110. He was also part of the trio that shot down an He 177 "New York" bomber on 4 January 1944-- the first time the type had been destroyed in the air by AAF pilots. Between his first mission on 11 November 1943 and August 4, 1944 Bob Punchy" Powell flew 89 missions with the 352nd FG. He claimed 5.333 enemy aircraft destroyed, 2 probables and 5 damaged. He was awarded the Air Medal with three Oak Leaf Clusters The Distinguished Flying Cross with two Oak Leaf Clusters a Presidential Unit Citation, and the European Theatre Award with three Battle Stars.